My night started out at the Beaumont Club, seeing the rhythmic “drum punk” collective Ad Astra Arkestra. In likely one of the most odd settings of the entire festival, the collaborative group on stage deserved a better backdrop and audience than the vastly unattended showcase in the stark vacuum of a venue for which they were given the opening slot. 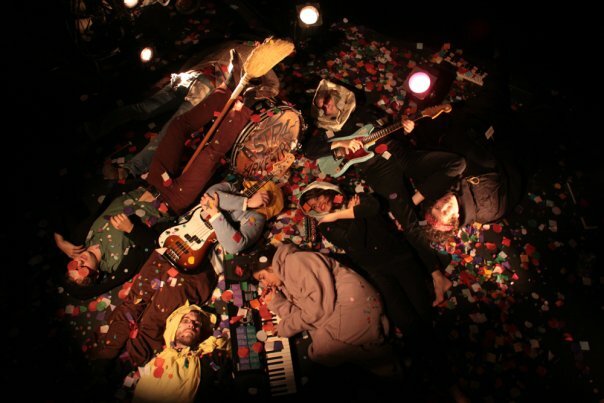 Numbering nearly a dozen members, the local group’s synergy was an undeniable force whose uncanny width and breadth of musical range was given a push toward visual absurdity. KC punk Mookie Ninjak served as the anti-hypeman, standing on stage drinking beer, playing with a cell phone, and generally embodying the same nonchalant attitude displayed by most of the crowd. By comparison, the eleven-piece Altos played at the same time to a packed Riot Room. Locale is key. Venturing through Westport Coffeehouse down to their dark, carpeted basement is where I was able to witness a stripped-down version of The Caves. David Gaume and Elizabeth Bohannon were both out of the city/country, leaving only Andrew Ashby with an acoustic-electric guitar, and drummer Jacob Cardwell experimenting with other forms of percussion, hastened as they were with the somewhat last-minute set change. The duo played a short and ascetic set that borne upon the audience new songs from the next two (!) 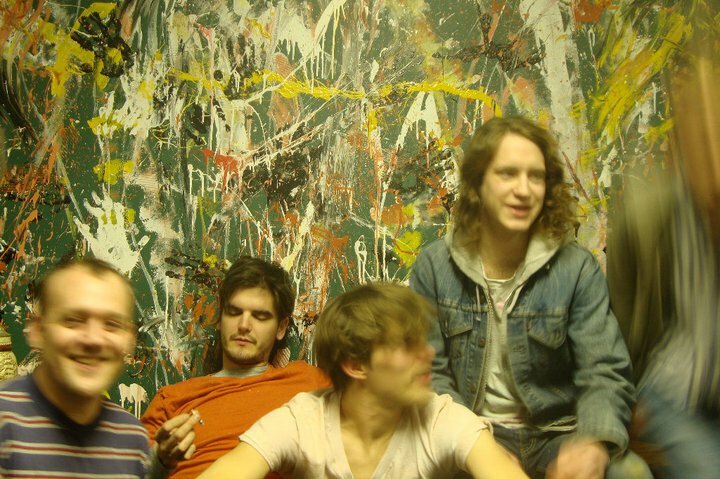 albums, and tunes from their debut EP with a naked melancholy akin to David Bazan. To reference my comment in the first paragraph, I could not have imagined seeing the two at any other place in town without coming across as inorganic and contrived. After the crushing realization that I had missed all but the last 30 seconds of Capybara‘s set, I made my way over to Gusto with minutes to spare before the fantastic Ghosty began playing. I’m a bit embarrassed by this admission, but as a follower since 2005’s Grow Up or Sleep In, this was the very first time I had ever been able to coordinate my life to be in the same room while they were playing. I know, I know. And if that weren’t bad enough, front man Andrew Connor and I worked together for nearly two years. My being a terrible co-worker and local music fan aside, the trio of Connor with Billy Belzer on drums and Mike Nolte on bass splashed a remarkably lilting and shimmering pop against the Gusto’s dilapidated, century-old brick interior. Though much of the set contained songs written and recorded in the last three years, their delivery is as timeless as the classic (power)pop influences that drive the band to continually release some of the most profoundly impressive work this side of the Mississippi River. Columbia, MO, indie rockers Believers drew me to the Riot Room later in the evening, and with me I dragged a few of my friends. The band performed well, and sounded adequate in the venue, but overall fell a bit flat compared to the great production quality of their recently released debut. In the thick of the casual conversations and clinking of pint glasses taking place all around the room, the complexities of the band’s sound was ultimately lost in a muddle of noise pollution. This resulted in the group’s otherwise immense creation being reduced to a pattering of drums and a yelp of inaudible lyrics. I ended up leaving their set early just so my first experience seeing them live wouldn’t be tainted by a distracted audience. Back to Gusto, The ACB’s made the bar two-for-two on quality sets from established local acts. That this band also contains Ghosty’s Andrew Connor is inconsequential, as he only provides one part of the flourishing powerpop quartet led by the charming falsetto of Konnor Ervin. The setlist has not changed much in the three times I’ve seen them in the last six months (with “My Face” and “You Did It Once” among those being played), but the band continues to add more and more new songs to the list, and each one that is revealed has that much more rump-shaking funk than the last. The band surprised with an addition of the hit that never was by playing “Suzanne,” and “Be Professional,” the first single from the band’s sophomore effort. Even more surprising was the inclusion of a flared-up rendition of Matthew Sweet’s “Sick of Myself” in the latter half. I thought it impossible, but the new album may end up being even better than the last. I chose Mission of Burma at the RecordBar to close out my second night, because who else could you really see after watching a band that first started playing together over thirty years ago? The Boston punk band formed in 1979 and played so extensively that they broke up in 1983 due to co-founder Roger Miller acquiring a nasty case of tinnitus. 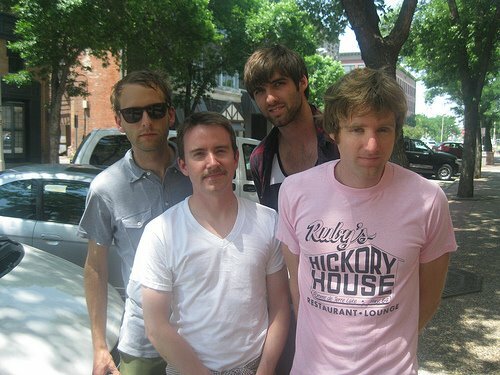 The band reformed in 2002 (with Shellac’s Bob Weston joining Miller, Clint Conley and Peter Prescott) and have been active since (releasing a new album this very year, in fact), but it goes without saying that almost every single person in the room was there to hear songs from Vs. and the Signals, Calls and Marches EP. The audience was not let down, as the band hammered through 70 minutes of brash post-punk that was easily a key influence for every other musician in the room that was not already on stage. The highlights? As if there were any other possibilities, the amusing “That’s When I Reach For My Revolver,” and a set closer of the punk classic “Academy Fight Song,” complete with the rather inebriated singing along by the audience. This review was written for Lost in Reviews. I would be a fool to hunt down and post every local show happening in the coming months. The metro area is experiencing a musical boom, and has been for the past few years, so I suppose limiting myself in the amount of shows I post here is both good and bad. Good that there are so many choices, but bad in that I don’t wish to show preferential treatment against those I choose to exclude. These days, most local events are pretty easy to track via the bands, venues or promoters participating in them, so if you miss out on something you only have yourself to blame. CANCELED: The September 29th Unwritten Law show at The Beaumont Club has been canceled, likely due to co-headliner The Ataris inexplicably dropping off the bill. 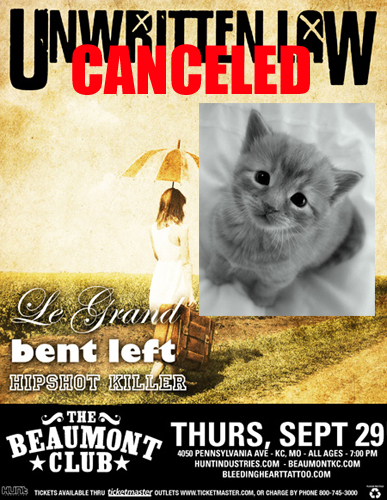 The show previously had three KC bands in support, including Hipshot Killer, Bent Left, and Le Grand. Hipshot Killer is one of the best melodic punk bands to come out of KC in a long time. If you haven’t already, you can pick up the band’s debut 12 inch at Vinyl Renaissance on 39th Street. For the tech savvy, a digital version can be purchased from their bandcamp here. 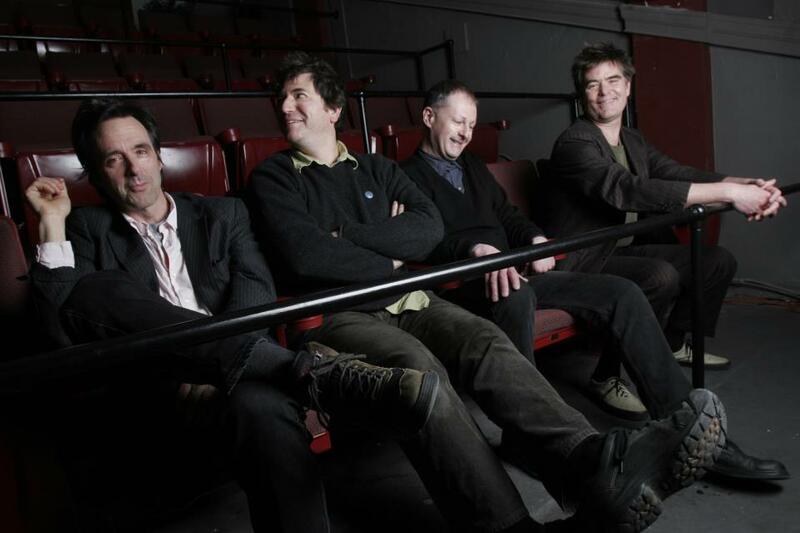 Bent Left has been a mainstay in the local punk scene for the better part of a decade, and has many politically-charged albums and EPs which can be purchased either through local stores or directly from the band. Le Grand, while not my bag, probably has a built-in fanbase with high schoolers who love auto-tuned and frankly generic pseudo-punk and/or radio-friendly “screamo.” Not trying to put baby in a corner or anything, but I have to call it like I hear it. 09/23: Kansas City via Chicago (or vice versa) space rockers The Life and Times are heading up an event at Crosstown Station for those who want to punish their eardrums (in a good way, of course). Not only will this be one of the venue’s last shows before their untimely demise of being turned into an urban church, but it will be one of only two times the headliner will make an appearance in our town before the end of the year (the other being an opening slot on the 11/04 HUM show at recordBar). Opening the Crosstown show will be thirty-something favorites Dirtnap (Are they together? Are they split up? 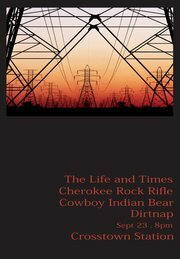 ), Larryville newcomer indie-pop sensations Cowboy Indian Bear, and Cherokee Rock Rifle, a hard-rockin’, hard-drinkin’, hard-sexin’ foursome with only one release under their belt, but a steadily growing local following due to the charisma of bar tending front man Nathaniel “Dutch” Humphrey. 10/01: Crosstown Station will be saying it’s goodbyes with a final live music show on October 1st. 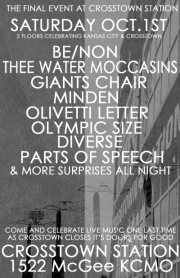 The list of names on the bill is long, not the least of which is a rare reunion from Giants Chair, co-creators of a ’90s indie rock sub-genre lovingly referred to by some as the “Kansas City sound” (shared in part with Molly McGuire, Shiner, et al). Also performing as part of the festivities will be Be/Non (the ever-changing sounds of the prolific Brodie Rush), Thee Water Moccasins (a side project of Roman Numerals), Minden (new project from members of Kelpie), Olivetti Letter (a brand spankin’ new band with members of To Conquer, Season to Risk, Doris Henson, and many others), Olympic Size (a mostly one-off project between members of Doris Henson, The Belles, and Roman Numerals that still pop up for an occasional gig), local jazz outfit Diverse (who often team up with other local musicians to pay tribute to past influences), and the synth-heavy sounds of Parts of Speech. Other unannounced and unbilled (Major Games) special guests are expected to appear, and if you are free that evening, you would be wise to attend. 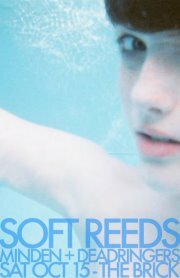 10/15: Kansas City label The Record Machine is releasing a new split 7 inch between locals Soft Reeds and Minden, and The Brick will serve as host to their record release on October 15th. Also opening will be TRM newcomers Deadringers. The event will be 21+, and the cover will probably be $7. Even if the flier says $5, bring $7, as the venue in question has a history of magically increasing their cover charges the evening of the show. Hear Deadringers’ single publicly released demo track here, and while we’re on the topic of TRM, go here to stream and purchase the debut LP from Ad Astra Arkesta. New releases (and coinciding release shows) can be expected from Capybara and Max Justus before the end of the year as well. If 2010 treated The Record Machine well, and 2011 has placed them in a local spotlight, it will be interesting to see what 2012 has in store for the label. 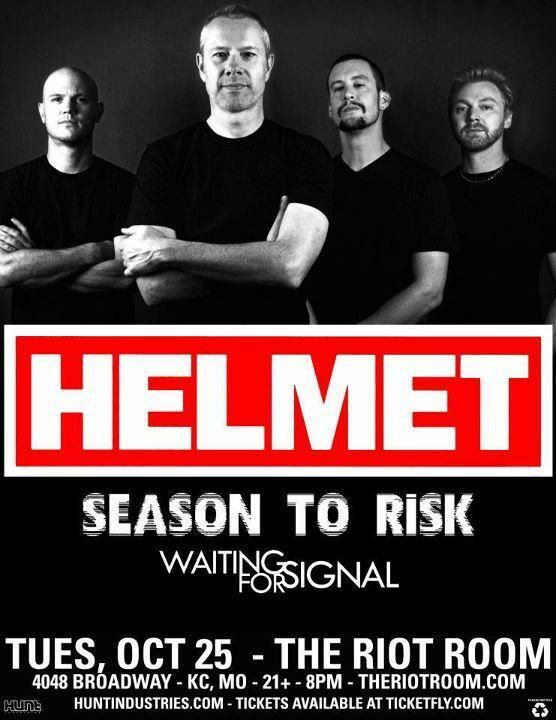 10/25: Last but not least, Season to Risk will be playing a very unexpected second gig this October, opening for the once great Helmet (or, as they have become since reuniting, Page Hamilton & Co) at Riot Room. Locals Waiting For Signal will be rounding out what is currently only a three band bill, sure to give at least some in the crowd a migraine due to either S2R’s smoke machine, or the deafening wall of noise coming from much of the lineup. Helmet has reportedly been playing a respectable amount of their older material, covering a lot of songs from Betty, Aftertaste, Meantime, and Strap It On. But, as is to be expected, at least part of their set will involve some of their newer, inferior songs as well. Season to Risk revealed before their first show of 2011 last month that they have now written two new songs as an inactive band. There is hardly any chance they will ever be recorded, so if you want to hear them, you know what you need to do.